Now Free Shipping from 100 Euro to Germany! Now Free Shipping from 300 Euro to the European Community and Switzerland! Now Free Shipping from 700 Euro to the whole World! No German VAT (19%) for customers outside the EU! Reduced prices will be shown, when you register as a non-EU-customer! Yesterday, the new BMW R90S motorcycle engines in the huge scale 1: 2 arrived here. Fantastic functional models, complete with working gearbox! A must for all BMW motorcycle fans. Please note: Hiro speaks of a very limited number of reissued kits. Order as early as possible, if you want to secure one of these coveted kits! We are starting a 10% discount price special from March 1st on all stocked 1/12 Hiro kits. The special will last during the whole March and ends on 2019-03-31. Today we have added all Hiro kits in scale 1/20, which are available from the manufacturer in Japan, to our webshop. From now on, these kits are also easy to order via the shop. Please note, however, that all 1/20 kits are also order items that we normally do not keep in stock. We have included all Hiro kits in 1/24 scale in our webshop, which are still available in Japan. From now on these kits can be easily ordered. Please note, however, that this is an order item that we do not normally keep in stock. However, as we order from Model Factory Hiro at short intervals, our delivery times are significantly shorter than our competitors. After the first edition of the Pocher Ducati Panigale in 1/4 scale has been sold out for months, Pocher has announced a new model variant this fall: Ducati Panigale 1299 S Anniversario. There will be only 1500 copies produced for the entire world market - from the first Ducati Pocher has made about 4500 pieces. Therefore, we assume that the new version will be sold out relatively quickly. The price is Euro 699.00 - the usual frame for large models. We give a pre-order price discount of 5% until the release in October! Therefore, order now - the payment must be made shortly before publication. Pocher Importer LEMKE has created their own brand for car model kits in the big scale 1/8th: LeGrand. The westphalian company is presenting a first kit on the occasion of the Nuremberg Toy Fair: VW Beetle Cabriolet in the colors sun yellow and viper green metallic. Official price for the new Volkswagen, which was so far only available as a collection series, is Euro 698,00. From now on, this pretty convertible can be ordered from us with a pre-sale discount of 10%. The special price is valid until February 28, after that date we give a subscription discount of 5 % until the delivery of the kits in May. 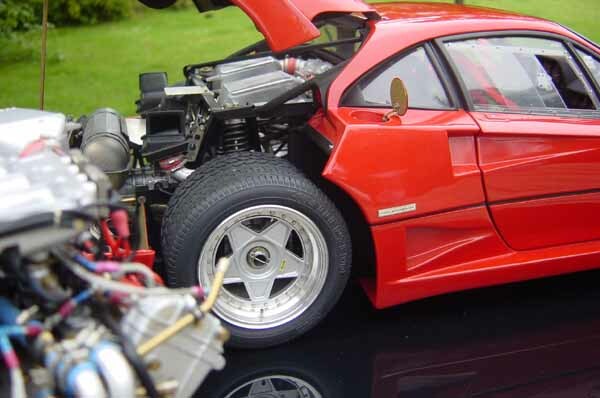 We have put together the last available components for our F40 Transkit and once again launched a total of 10 copies of our F40 Transkit. This is likely to be the last reissue because some components (such as decals), that can only be produced in larger quantities are coming to an end. The price remains stable: Euro 1450.00 (including VAT for EU customers) or Euro 1218.49 (for non-EU customers). Shipping costs included! Please note: These kits are available on Special Order only. We will not stock these kits regularly. Once again, Hiro will produce a very limited number of the following kits in January 2019. If you choose one of these kits, you should immediately order from us, as the new productions will be sold out relatively quickly. Please note, that we deliver 1/20 and 1/24 kits only on special order and we will not stock kits in these scales. Contrary to their announcement of the end of the license agreement with Ferrari, Hiro has announced on their website a number of new Ferrari kits. At the moment we can not say if and when these will be produced, and information from Japan was not received by us despite our request. Hiro has announced on its website that its Ferrari license agreement ends on 31.12.2018 and will not be renewed. This means that all licensed Hiro Ferrari kits will no longer be produced in the future. Upon request, Kyoko Hiro informed us that the sale of Ferrari kits will continue for some time after the end of the contract, so that existing stock can be sold off. Ms. Hiro emphasizes that at the moment it is not necessary to make hasty orders of Ferrari kits. In the medium term, however, our customers should secure their desired kits. We have made a large order in Japan, so we are able to deliver your desired HIRO-Ferrari kit even after the contract ends. 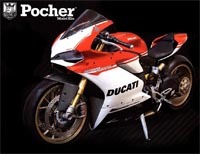 All Pocher Ducatis we had in stock are sold out now! Pocher can no longer deliver kits, allegedly the entire production is sold out. We got the first green Huracans! Earlier than expected - Vestergaard seems to be doing a better job than Hornby in punctual delivery of new releases. From now on the green Huracan is available! In contrary to the most of our competitors, we have sufficient stock of this kit. We are agle to deliver immediately! The red Huracan is also in stock. But we do not have as many as from the yellow version. For the world market only a total of 1500 Pocher Huracans were produced - 700 in red and 800 in yellow. Only 350 of them come to Germany: 150 red and 200 yellow Huracans. A new production is not provided by Pocher! Model Factory Hiro brings out at least one new 1/12 full-detail kit in several variants each month. In return, a number of kits from current production are no longer available. Please note that AUTOGRAPH can not stock all 1/12 HIRO kits in all variants. However, we will stock all Ferrari and Porsche as well as some other attractive models. All other kits will be order items with a reduced price. We are weekly ordering in Japan, so if you want to buy a kit, that is currently not in stock, we (normally) should be able to help you within one week! Even with the kits in 1/20, 1/24 and 1/43, which we currently don't stock! Most of our competitors don't stock older kits and are only ordering monthly, so you'll have to wait more than 4 weeks on your order with them. Hello and welcome to the Autograph webshop! We are continuous! Since 1990 we are reliably selling our kits to the whole world. We know our business! Competence and expertise are no foreign words for us. We also deliver spare parts! If something goes wrong, or if something's missing: just contact us! We can help. We have low prices! Although we do not belong to the "case sliders", which leave you alone after purchase, we have impressive prices! We have a large selection of rare new and antiquarian kits. Please talk to us, if you are searching for a special model, which we are not offering at the moment. We make every effort to offer you a selection of exceptional and rare models, kits and transkits in the big scales. We also have a large selection of additional parts in stock for detailing your kits. Our stock is constantly changing, and should you be interested in a special item, which we do not currently offer, please write to us at info@autographmodel.com. For our international customers we are always looking for interesting kits, preferably in the scale 1/8 or 1/12th. We buy individual models, like also started projects or incomplete kits (eg Pocher or Promocom) and entire collections or estates. Please email us at, if you have something to sell. We will make you an interesting offer! If you decide to part with one of your finished models or kits, so you should contact us. We have added a new category "customer sales" in our web shop, in which we provide a platform to our customers for their model sales. We have hundreds of visitors from around the world every day on our site, and there is also an interested party for your special model! The prices shown in the shop include the German VAT (19%). The VAT amount will be automatically deducted, if the shipping address is outside the European Union. This results in a saving of about 19% for our non-EU customers! Please also refer to the pages International orders and shipping costs.